I began Clockwork Angel with some trepidation. Could Cassandra Clare pull off a new series set in the same world as The Mortal Instruments? Would The Infernal Devices just be The Mortal Instruments set one hundred years earlier or would the series distinguish itself? I'm pleased to say that I had no reason to be concerned. 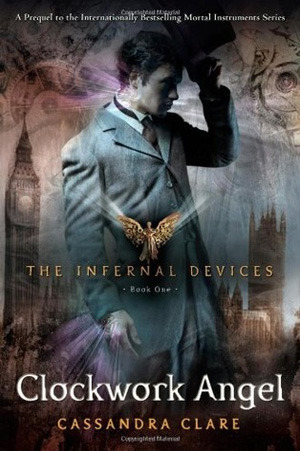 The Infernal Devices is an entirely separate plot from The Mortal Instruments with fully fledged characters. Clockwork Angel and The Infernal Devices series is as good, perhaps better, than The Mortal Instruments books. Clockwork Angel features three main characters: Tessa, Will, and Jem. Actually, it's more accurate to say four main characters. Magnus Bane, the warlock I came to know and love in The Mortal Instruments, plays a more significant role in these books than he did in TMI (at least he stood out more to me). Tessa is somewhat like a 19th century Clary. She's kind, extremely devoted to her family, clever, stubborn, and a good judge of character. The biggest difference between Tessa and Clary is cultural. Tessa grew up in a world with strict views of politeness (using Mr. and Miss instead of first names), propriety (servants v. gentlemen), and gender roles. Tessa lives within a small box of societal expectations. She steps out of it as the plot develops and as she becomes more comfortable in the Shadowhunter world, but she seemed less direct and more hesitant than Clary. I don't mean that as a criticism or compliment to Tessa or Clary, but merely a difference of worldviews and personality. Clockwork Angel introduces us to two handsome, lovable leading men, Will and Jem. On the surface, these characters are as different as can be. Will is like a raging river. He'll take you to your highest highs and your lowest lows. He's capable of heart-stopping passion but also heart-wrenching barbs and cruel sarcasm. Jem is like a calm lake on a warm day. Comfortable, reliable, kind. He's the nice guy that a girl should want - although it's the bad boys like Will that tends to grab me. The secondary characters are numerous and well developed. Magnus is definitely my favorite. He was introduced to us as a devil may care party thrower in City of Bones. I could never shake the image of him as being merely lighthearted and quick with a joke, even though we saw more sides of him in The Mortal Instruments. He is still funny and easygoing, but strikes me as far more passionate, serious, and knowledgeable in Clockwork Angel. I was initially concerned that Jessamine was simply a copy of Isabelle but she distinguishes herself as having very different priorities and strength of character. Charlotte is the capable mother figure/Institute head and Henry is her absentminded inventor husband.. Charlotte's role as head of the London Institute and the drama that caused shows us that Shadowhunter's ideas of women's roles was both ahead of its time and trapped by its time. Like all of Clare's books, Clockwork Angel has plenty of action. In one chapter, the characters are fighting warlocks. A few chapters later, it's a vampire battle. Then comes war with metal automatons. There is perhaps less action in this book than in The Mortal Instruments. Much time is spent introducing the characters and developing their relationship. That's not a bad thing. It's action in a different way. The plot steadily progresses. If I have a criticism for Clockwork Angel, it would be confusion. I'm writing this review after having read all three books. Now the world and characters make a lot more sense. When I first read Clockwork Angel, I had trouble understanding characters' actions - especially Will's. The mystery unraveled over the trilogy, but sometimes it felt like plot elements or character development were just thrown in there without context. For example, the prologue featuring Will and Jem fighting a demon. Looking back, it establishes their closeness and the parabatai relationship that is just as important as the series' romance. At the time though I didn't know these characters and the scene had only a slight relationship to the plot. Looking back on Clockwork Angel after reading the whole series, I think it's wonderful. It gives a good basis to the characters and starts the plot off right. When I first finished it, I was unsure. The Infernal Devices is an incredible series. Clockwork Angel is a good start, although it didn't draw me in as much as the second book did. I loved this book and I'm just reading City of Bones now. I'm so glad that I read The Infernal Devices before the Mortal Instruments. That's why I waited. Will and Tessa are incredible characters and I really do miss them. :) Great review Alison. I really liked this book too. I still haven't read the last one though, maybe soon. Great review. I enjoyed this story but I do agree about the confusion. I haven't read the rest of the series (and probably won't...I'm bad about that) but there was just so much going on! You know what? I still need to finish this series. I bought the final book but have yet to read it. Maybe its time I finish it right? Nice review. I'm in the same boat as Savannah. I have reading the first two books, but not Clockwork Princess. I'm kind of terrified. I'm not a huge fan of the whole Tessa-Will-Jem love triangle. I generally don't like love triangles to begin with, and I just can't comprehend Tessa loving both Will and Jem. It's just not the kind of person I am, I guess. Not that I am criticizing Tessa, or that I think I'm better. I just can't relate to it. But I need to read C. Princess. Oh, and I agree about Magnus. I fell so much more in love with him reading the ID. I love this prequel series much more than MI. The writing is tighter and better. I also love the Victorian setting and the characters were much more fleshed out. I think I read a Q&A on Clare's tumblr saying that there is going to be a spin off of this series featuring two characters in this series. I don't want to say who in case I spoil C. Princess for other readers. I absolutely love TID! I got the books after I saw everybody tweeting and commenting about CP2 and I knew I had to read them. And they didn't disappoint! I would love to read them again some day, but seeing as I just finished them a few months ago, I'll have to give my mind/heart a bit of a break from these characters. I love this series. Clockwork Princess is my favorite of all Clare's books so far. I loved Clockwork Angel when I first read it too. Then, I read Clockwork Prince and I was just amazed with it. Because I haven't yet read Clockwork Princess, Clockwork Prince is my favorite of all of Clare's books. I love this series and I really need to get reading Clockwork Princess. I really enjoyed the Infernal Devices series ! I just finished Clockwork Princess and it was full of the same action and adventure. I liked how there was more Magnus in this series. I just finished reading this book! :) Great to know and understand more. I really enjoyed this series a lot! I thought it would be the same as TMI but further back in time and with steampunk elements, but it really was it's own story. So glad you enjoyed this! Great Review :) I'm thrilled you enjoyed Clockwork Angel! The series is so good. Although, I do agree that the first one is a bit confusing until you read the rest, you know, I could do with a re-read now too! Yeah, I loved TID more than TMI overall, as well. I was also worried initially that it would just be a carbon copy of TMI, but I loved how the series felt clearly distinct, but also connected in numerous ways. CC just KNOWS how to write good characters and action scenes and I love that!